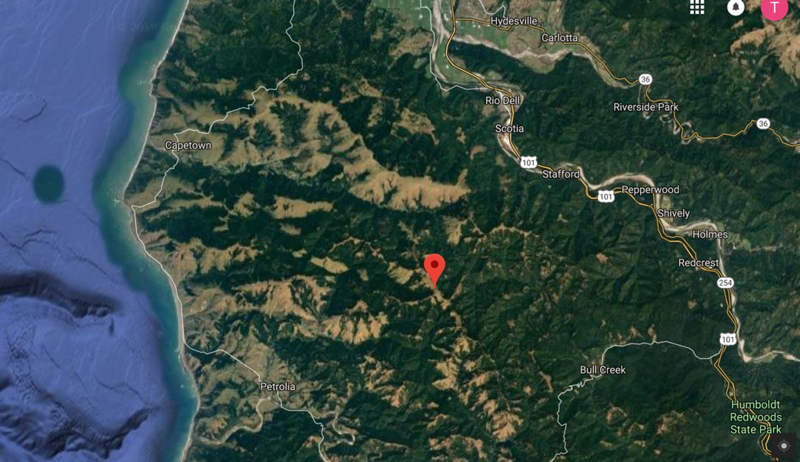 The Rainbow Ridge area where Humboldt Redwood Co. holds two approved timber harvest plans. A group of environmental activists is planning a protest Thursday in front of the Humboldt Redwood Co.’s Scotia office with the hopes of preventing planned logging activities in the Mattole River watershed. The protest comes a week after several people were arrested on Humboldt Redwood Co. land in the Rainbow Ridge area of the Mattole River watershed west of Redcrest. The protesters, who erected a logging road blockade, say they are working to protect about 1,100 acres of what they call pristine forest — meaning it hasn’t been logged — primarily consisting of old growth Douglas fir. But a crew from Lear Asset Management, a private security firm, removed the blockade and arrested a total of three protesters July 22 and 23. The protesters allege the security contractors brandished Tasers and used other aggressive tactics that put them in danger. After another group of protesters briefly chained themselves to an access gate near Rio Dell last week, the group reportedly agreed to stand down after Humboldt Redwood Co. assured them no logging would take place on the property for at least a week. In an interview with the Journal last week, Humboldt Redwood Co. Director of Forest Policy John Andersen said protesters have been on the land for at least a year but the company felt a need to intervene after learning recently that one of them suffered a bad burn to her leg, necessitating medical treatment. “From what I understand, they were boiling water and she stepped backward onto the pot of water,” Andersen said, adding that Humboldt Redwood Co. employees heard of the injury and went to the protest site to make sure the woman was taken to get medical care. Once at the protest site, Andersen said company employees saw a fire ring “immediately adjacent to some tall, dead grass,” raising a host of concerns. The protesters argue that direct action is necessary to prevent logging of the forest, which includes ancient stands of coastal Douglas fir, some more than 300 years old, providing habitat for a number of listed species, as well as a rare fungus. Andersen said Mendocino Redwood Co., Humboldt Redwood Co.’s parent company, has had an old growth policy in place for decades preventing it from cutting old growth trees and stands. The company holds two approved timber harvest plans for the property, both of which are overseen by at least five agencies. No old growth stands or trees will be harmed in any future logging operations, he said. But protesters charge that’s not the case and that even if the company doesn’t actively log old growth, it will use herbicides that will damage the lands. They also argue that any logging activity will harm the fragile ecosystem of the Rainbow Ridge area. While no logging plans are imminent, Andersen said the company does plan to go in and thin some parts of the property “at some point this summer.” He said Humboldt Redwood Co. policies allow tours for concerned or interested members of the public, and he urged anyone interested in learning more about the company’s plans for Rainbow Ridge to reach out and request a tour. To date, he said the company has already taken more than 50 people out on 13 field tours of the area. The protesters will be gathering in front of Humboldt Redwood Co.’s Scotia office (125 Main St.) from 10 a.m. to 3 p.m. Thursday. They are encouraging people to bring “instruments, signs, friends, food, water and family” to say “enough is enough,” decry the private security contractor “goons” and demand that Humboldt Redwood Co. leave the Mattole. “We are encouraging the public to attend … to tell HRC that the public does not want it logging ancient forests and to show solidarity with those who were arrested, assaulted and harassed by private paramilitary security contracts hired by the company,” the group Mattole Action Camp said in an email to the Journal. See the full press release announcing Thursday’s protest copied below. And see a full statement from Humboldt Redwood Co. here. WHERE: Humboldt Redwood Company (HRC), Scotia Office, 125 Main St.
Let's build a huge show of community opposition to industrial logging plans in the Mattole River Watershed. Make this the last year we have to fight to protect this awesome area! Rally on Thursday to protect the Mattole river watershed from new logging roads, disastrous landslides, toxic hack-n-squirt herbicide deaths (timber company puts poison inside hardwoods so they die standing, and become exponentially more flammable), the cutting of old growth Douglas firs in un-entered forest, the sedimentation and heating up of the Mattole river, and the ravaging of critical and contiguous habitat. Also, please Rally on Thursday in solidarity with direct action forest defenders. Humboldt/Mendocino Redwood Company now contracts with Lear Asset Management, a paramilitary style 'security outfit. Last week, Lear goons went out to the Rainbow Ridge area of the Mattole to threaten with tazers, dogs, and physical force, unarmed, peaceful forest defenders many miles deep in the woods. They stole defenders' survival gear; did dangerous things to the ropes holding defenders high in the air; employed sleep deprivation tactics with Mattole defenders over 100 feet above the ground; and, for hours, held down activists who were on the ground doing forest defender blockade support, until the Humboldt Sheriff's Department showed up and took the activists to jail. Lear camo-clad goons failed to even ask the forest defenders who they encountered on the ground to leave the area; they simply pointed tazers at them and took them down. This is unacceptable. The company needs to know that the opposition to their logging plans is mighty. It won't go away with arrests and violence against activists in the woods. Protest against Humboldt Redwood Company. Bring instruments, signs, friends, food, water, and family. Enough is enough. HRC out of the Mattole!! Please text or call Ezra at 707.476.3567 and tell him how many people can fit in your vehicle or how many of you need a ride. There are a couple of buses going south to Scotia on Thursday that get in around 9am and 12 noon. Hope to see you at HRC's Scotia Office on Thursday FOR THE MATTOLE!